Hugh and I got super crafty this weekend! On Saturday, I was planning to go to an introductory sewing course (for free!) at the Wood Street Arts Space. At the last minute, Hugh decided to come along, too. The Arts Space had sewing machines for us to use, and I took all my bits of fabric I've been collecting for the last few months. The problem was, some bits weren't washed, and others were washed but not ironed. Oops! 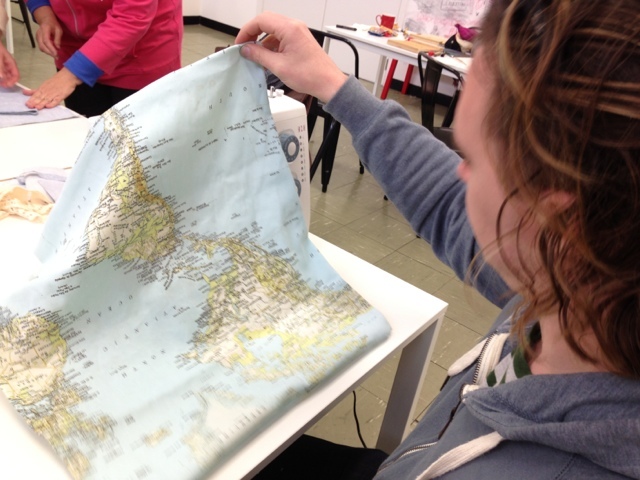 We decided to make a cushion cover out of the world map fabric I got from Spotlight. The woman leading the class gave us lots of helpful tips about stitches to use and how to make a button closure. We switched spots so we both got to work on the machine. This pillow was a team effort! Couples sewing is fun! After sewing, we went to Spotlight, because they were having a 40% off sale on all their yarn! I bought 12 balls of yarn, and Hugh grabbed some supplies to work on his own sewing project. Then we came home and got to work! I made napkins! I used my 1-2-3 Sew! book--napkins are the second pattern in the book. In this project, you learn mitered corners. Trying to figure out what the instructions were telling me to do took a while, and there was a point where I wanted to shoot the author, the napkin, and myself. But once I figured it out, I was so impressed! Mitered corners are fun! I was really pleased with the result, even if it wasn't exactly square. It rained heavily on Saturday, and I was really hoping my softball game on Sunday would be cancelled so I could stay home and craft some more. Joy of joys, it was cancelled and I got to stay home and craft! Result! I don't know how to do mitered corners! Jealous! I LOVE that map fabric! And the napkin fabric is cute too.